On the morning of 13 May 2018, the symposium on “From West to East: Visions and Methods of Chinese and Western Art Criticism in the 20th Century”, “Selected Readings of Chinese Art Criticism in the 20th Century” and “Selected Readings of Western Art Criticism in the 20th Century” were held at CAFA. Editor-in-Chief of the “Selected Readings of Chinese Art Criticism in the 20th Century” and Editor-in-Chief of the Journal of CAFA, Prof. Yin Shuangxi, Editor-in-Chief of “Selected Readings of Western Art Criticism in the 20th Century”, PhD supervisor of the School of Philosophy at Fudan University and Director of the Research Center for World Art of Zhejiang University, Shen Yubing, and Deputy Dean of the School of Art and Design at Wenzhou University, Zhang Xiaojian, attended the symposium. In addition, the honored guests who participated in the symposium included (in alphabetical order by the last name): Deputy Director of the CAFA Library, Cao Qinghui; Deputy Head of the Department of Curatorial Research at CAFA Art Museum, Cai Meng; Director of the Department of Teaching at the School of Graduate, CAFA, Ge Yujun; Director of Theoretical Publishing Department at CAFA Art Museum, Guo Hongmei; the well-known art critic Jia Fangzhou; Deputy Dean of the School of Humanities of CAFA, Shao Yiyang; Deputy Editor-in-Chief of the Fine Art magazine, Sheng Wei; Deputy Director of CAFA Art Museum, Wang Chunchen; Director of the Department of Research on Chinese Painting, Yu Yang; Prof. Yu Runsheng from the School of Humanities of CAFA; Deputy Editor-in-Chief of the Journal of CAFA “Art Research”, Zhang Peng; Editor-in-Chief of CAFA ART INFO, Zhang Yanzi; and Associate Research Fellow, Zhao Yan. In the West, the 20th century was honored as “The Times of Criticism” by art historians and critics, many critics including Apollinaire, Roger Fry, Walter Benjamin, Herbert Read, Clement Greenberg, Harold Rosenberg, John Berger, Arthur Danto, Hans Belting, Rosalind Krauss and Theodor Adorno appeared and created a variety of artistic movements, resulting in a splendid artistic landscape; China’s society has also evolved in the 20th century. The young artists who had received a professional education after the end of Cultural Revolution were influenced by Western philosophy and aesthetic thoughts during that period, and yearned for all new artistic styles and forms. The art creations and art criticism closely interacted, and the world of critics was presented with a scene of “a hundred flowers bloom”. 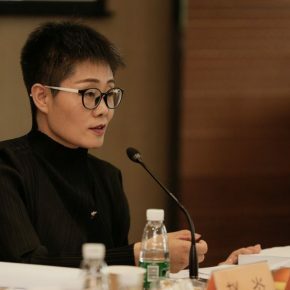 Editor-in-chief of “Selected Readings of Chinese Art Criticism in the 20th Century”, Professor Yin Shuangxi, introduced the structure of the book. Rather than organizing articles based on the time sequence, it has been divided into three parts including “Artistic Thoughts and Controversies” and “Art Exhibitions and Reviews” and “Criticism and Theory of Art”, to initially present the development of Chinese art criticism in the 20th century. Professor Yin said that if there was no previous theory of criticism, it was like water without a source when people studied art criticism. “Selected Readings of Western Art Criticism in the 20th Century” is composed of “Models of Criticism” and “Theories of Criticism”, covering representative Western literary criticism and theories of many periods in the 20th century, so that when the readers appreciate the exemplary articles of Western criticism, they can have an in-depth analysis of the theories and methods of art criticism. One of the editor-in-chiefs of this book, Shen Yubing, emphasized academic research was important and independent. As ancient art is often connected with politics, modern art has also been the focus of the market competition, so it is vital to achieve an ideal state of balance and constraint. “Scholarship needs independence and the literature is the basis of academic research”. Shen Yubing further pointed out that, “In the process of the compilation of documents, we need to be in awe of scholarship.” Another editor-in-chief of this book, Zhang Xiaojian, said that the accumulation of documents was important, “academic research needs to pay attention to previous literature”. With this view in mind, there are few books on art criticism in the market, it is particularly important to publish this book. 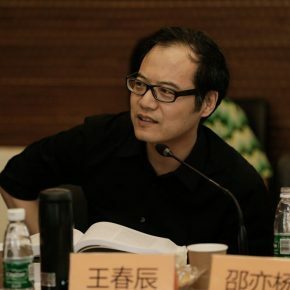 Jia Fangzhou said that the rise of artistic criticism in the 20th century was closely related to Western modern art. Without Roger Fry, there would be no post-impressionism; without Greenberg, the concept of American abstract expressionism would not emerge, “it is because of the participation of these critics that it offers art tremendous vitality.” For contemporary art criticism, in the opinion of Jia Fangzhou, contemporary critics look like artists, because critics directly face art while artists directly face “objective items”. Contemporary art criticism is facing an unprecedented crisis. It has been asserted that the era of criticism has passed and contemporary art is dominated by capitalism. In the era of capitalism, self-media and pluralism, how we can preserve the independence of criticism? Is contemporary art criticism really speechless? What is the significance of the compilation and review of the texts of criticism in the 20th century? Nowadays everyone can make their voice heard, but it is too chaotic that no voice is really heard, so that some people from the critic circles said “the contemporary art criticism has died”. Yu Runsheng pointed out the predicament of contemporary art criticism, and he said that once a criticism was recorded by the history of criticism, it was like a work placed in the museum with the loss of presence and moment. In the era of Internet, on the other hand, it does not bring forth a flourishing development and the criticism as an “intermediary” for the artists to communicate with audiences has also begun to lapse. Art creation has relied less and less on artistic criticism, and even some works have gone ahead of criticism. 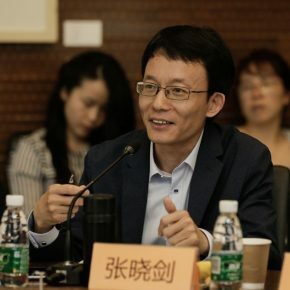 Professor Wang Chunchen believes that, in the era of the Internet, “it is unnecessary to worry about readers’ writing”. But, Sheng Wei pointed out that the current crisis of criticism has led to two results. On the one hand, art criticism is now historical and theoretical, and then it was created as a course at universities, which does not make it further extend to the public field; on the other hand, a new art criticism paradigm has been established by the Internet, “If we talk about it on a modernism level, certainly a variety of cyber criticisms do not belong to ordinary criticism”, and Sheng Wei said that, “Is there a new paradigm of future art criticism? 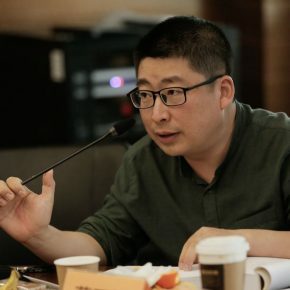 It is something that we can’t predict, and the Internet may bring a brand new mode of criticism.” Zhao Yan also believes that the present study of the history of art has begun to incline to the development of a “critical history of art”, which can also be considered as an expansion of criticism. In addition, several professors from the School of Humanities at CAFA were present at the symposium. They started with the teaching, to point out that the publication of the two books were timely because of the lack of a textbook on criticism. Shao Yiyang said that that these two books were not only the selected texts of critics, but also a set of theories; Zhang Peng said that the sorting and compilation of classic textbooks was critical of students that learn and make progress; Guo Hongmei took “Xu Beihong – Living Art Forever” as an example to expound on the importance of the sorting of classic literature, and she also said that both books were not only a sorting of texts, but also a “compilation of historians’ consciousness”; Cao Qinghui proposed that the teaching material was important, but more importantly, we should currently pay attention to the establishment of the library big data; Professor Yu Yang said that the research on the background of the history of criticism was not independent, and a piece of the history of criticism exposed a background in art history; Ge Yujun started with the theme of the symposium “From West to East”, to emphasize the significance of the two books; as the Editor-in-chief of the academic media CAFA ART INFO, Zhang Yanzi, said that, online media should demonstrate the academic attitude in the era of the Internet and persist in the publishing of high-quality critical texts. As a publication project funded by the Center for Literary and Art Criticism at the China Federation of Literary and Art Circles and Chinese Criticism Base in Literary and Art Circles at CAFA, the publication of the “Selected Readings of Chinese Art Criticism in the 20th Century” and “Selected Readings of Western Art Criticism in the 20th Century” concisely constitutes a clue through which we can to some extent observe the historical trajectory of Chinese and Western art criticism in the 20th century which is of great significance to contemporary art criticism.